The Naked Vine: Wine Advice for the Rest of Us.™: Who ya got? -- Pinot Noir Smackdown! Bota Box vs. Black Box. You drink box wine. I know you do. We’re all friends here. I won’t tell. You close all the blinds and make sure the neighbors aren’t watching before you open the kitchen cupboard to sneak a little splash of merlot from that little plastic spout, or you move aside the Tupperware of leftover potato salad from the office potluck to get a glug of pinot grigio when no one’s looking. I drink it too, you see. There’s nothing inherently wrong with it. For the sake of full disclosure, I often have a box of red and a box of white floating around the house. I don’t keep it because it’s necessarily great wine. I keep it because I don’t always want to open up great wine. Box wine serves a particular niche. Box wine is wine for drinking, not thinking. Sometimes, wine just needs to be good enough. When I flop on the couch after a long day at work or at the end of an evening, I don’t really want to dig in the cellar and pull out something special. 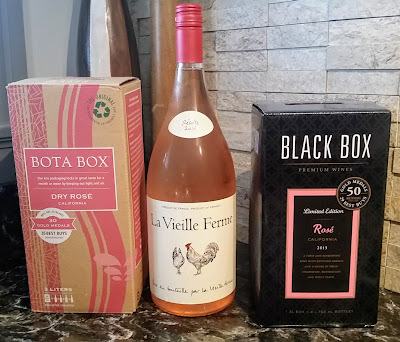 Box wine has come a long way since the huge cardboard containers of Vella and Franzia which often look like building material for the back walls of wine stores. I’ve written about box wines before, and I’ve come to the conclusion that while box wines aren’t generally going to blow you away, better mass-production techniques and greatly improved storage systems have improved the quality to a point where you can knock the stuff back without feeling like you should be drinking out of a brown paper bag. · In this corner, hailing from the Valle Central and Casablanca regions of Chile, weighing in at 13.5% alcohol, comprised of grape blends unknown, retailing for $22 – Bota Box Pinot Noir. · And in this corner, from across the many hills and valleys of California, weighing in at 13.2% alcohol, comprised of 78% Pinot Noir, 21% Syrah, and 1% “Dry Red,” retailing for $24 – Black Box Pinot Noir. How are these wines side-by-side? Despite the color scheme of the two wines’ packaging, the Bota Box actually pours a little bit darker. Since they’re both wines made in the “style” of pinot noir, both have cherry and strawberry flavors, and both have gentler tannins than, say, Cabernets or a Malbecs you might find in a box. The Bota is the richer of the two, with more cherry and cola flavors, and a lot more tannin on the finish. It certainly tastes closer to what I’d expect from a pinot noir than the Black Box, which showed as a little more acidic, had a lighter body, and really didn’t go anywhere on the finish. Head to head as a first glass: Winner: Bota Box. Did you know that the second ring on a standard red Solo cup is a five ounce pour of wine? See? All sorts of useful information here. (Also, the first ring is 1.5 oz – a shot of liquor. The top ring is 12 oz – a standard beer.) The next test for our battling boxes was to see how they hold up after a couple of consecutive glasses. At a party or other social occasion, a box of wine on the table doesn’t exactly say, “Just have one glass.” Also, odds are, there’s no fine stemware service. On separate days, I had three small glasses over a stretch of time to see how the wines progressed. The Black Box’s more-nondescript nature actually played to its favor here. By the third glass, it settled into a “hey, I’m having some wine” groove. The Bota’s extra tannin was drying out my mouth by the third splash. For session purposes: Winner: Black Box. The SPinC generally goes to bed earlier than I do. The pups generally join her, so I have some quiet time to myself before I call it a night. I’ll occasionally allow myself a nightcap as I kick back, so these wines made appearances in that relaxing space over the course of a couple of evenings. By that point in the evening, neither wine really contributed much other than something to sip on as the hour made things get foggy around the edges. Being that it’s August, I’d probably give this round to Black Box on points, but not by any huge margin. In the wintertime, I’d probably swing the other way. As I mentioned, we’ll swing over to box wines after we’ve already killed off a “good” bottle earlier in the evening. That transition can be, shall we say, “abrupt” – especially if the previous wine was particularly good. We got on a bit of a cooking roll this week and hit a series of really nice cellared wines. As one might expect, the wine with a little more structure buffered the inevitable “yep, this wine’s not nearly as good” transition a little more successfully. Winner: Bota Box. The last of those wines from the cellar was a 2007 1er Nuits-Saint-Georges Burgundy. I cracked that to go with a couple of duck breasts with a sweet cherry sauce. The wine was musical and the meal was magical. We had a little bit of the Burgundy left at the end – and, for science, I gave each of these boxes a chance to take a run at the champ. I’ll save you the trouble of trying it at home. Don’t. Just don’t. In comparison, the Black Box tasted like a pop tart and the Bota had a finish of charcoal. There are no winners here. Draw. 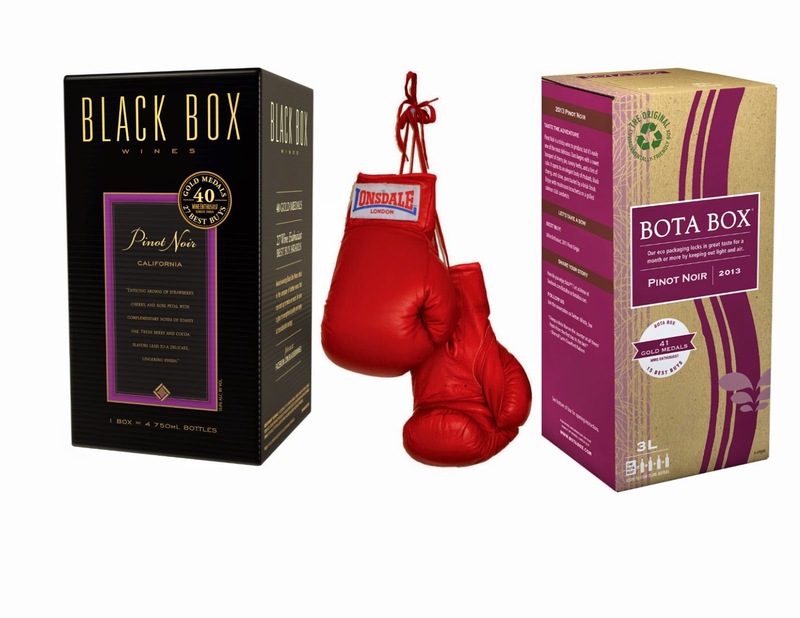 Overall – Bota Box is the better overall wine, but the Black Box serves its purpose. Either way, you’re getting four bottles of wine you can consume without cringing for a sawbuck. Drink up. Have you ever found a pinot box wine that wasn't adulterated with syrah/malbec/zin/cab/franc? We tried the Bota and the pinot flavor was barely recognizable. En francais, on peut dire enculer par cabernet franc.